Warning, this is a long post, but here’s the thing. If you don’t have 5 minutes to read this from start to finish, you simply cannot afford to be creating content. I’m serious. It’s a bit like going travelling without insurance. Nuts. Such a small investment, such a massive ROI when things don’t go to plan. So why should you consider these 12 points, and take the recommended actions, before you even start the process of creating a leveraged income from your expertise? Because when you don’t, you waste time, energy and money on things you don’t need, people who mess you around, and ultimately you can end up creating products that will never, actually, work. In other words, you’re running the risk of investing months (or even worse years) creating products that no one actually wants to buy, or that you end up pulling your hair out trying to deliver. Before you know it you’ve created yourself a 9-5 without the paycheque and you’re ready to throw it all in. I’ve done those exact things myself; hard lessons no one should have to learn the hard way if they can avoid it. The toll these things can take on your physical and mental health, not to mention the strain it can put on your relationships, well yes. Not advisable. That’s a story for another day though. Onwards! It’s not just me though. I’ve seen client after client come to me after having done those exact same things. And you know what? It breaks my heart to see it. Passionate professionals who have content that can seriously change people’s lives for the better, trapped inside their head (because they procrastinate beyond all measure, overwhelmed, confused, not knowing where to start) or trapped inside a product their clients don’t actually want, and that they themselves, can’t stand delivering over and over. Houses re-mortgaged, divorces pending, diagnoses of depression and anxiety, just some of the things I’ve witnessed my clients going through. I’m on a mission to help as many people as possible, avoid all that. Don’t blindly get yourself lost in the maze that can be content creation. Create a life, and a business that lifts you up and that you KNOW is sustainable for you, your family, and whatever type of lifestyle you’re planning. Consciously create something that you WANT to wake up to in the morning, that continually inspires you, and that brings you in an income with ease and simplicity. BEFORE you create materials that leverage your expertise. Create a product that will work, for YOU. Now I realise that sounds a bit ridiculous, but hear me out. This is NOT about creating products that your clients want (that part comes later), but about two things. Firstly, building a product that is based on your strengths; what you’re best at, what comes most easily to you, what people applaud and thank you for. That work will be easiest for you to produce, and you’ll enjoy the actual process of delivering it, because it’s what you’re best at. When you’re slaving away doing things that AREN’T in your zone of genius, it feels like Ground-hog Day and you may as well be back in a 9-5. The other thing you need to be aware of here, is the roles and responsibilities you’re creating for yourself when you create your offerings – if you’re going to add a Facebook group to your community for example, that will require you to either run the group, or outsource someone else to do it. Know the responsibilities you’re signing up for when you create your offerings, and be happy committing to that time or financial outlay. Otherwise? Yep, you’re back in 9-5 groundhog land. ACTION: Know your key strengths. Know what you enjoy doing. Know your time and financial ‘budgets’. Then create products around that. Create a product that people RAVE ABOUT. Can’t stand the idea of having to be on social media plugging your wears every day, creating ads and facbook funnels or doing several product launches that run you into the ground? Me neither. The alternative to that, is creating a product so effective, that your clients are the ones doing your marketing for you. Their lives changed so much that you’re the first one they think of to recommend when they meet someone with that problem you helped them solve. Essentially creating a QUALITY product, is what will help you become established as the expert in your niche. Put out a crappy product, then blast people’s inboxes and newsfeeds trying to sell it? Be prepared for the reputation that will come along with that too. ACTION: Learn about, or implement, the principles of best practice teaching and learning. Learn how adults learn, and become a master teacher, trainer or facilitator of learning. Know what parts of the process you will DIY, and which parts are worth investing in professionals for. Yes, you can DIY everything, of course you can, you’re a capable, intelligent small business owner who is adaptable, fast learning and very tech savvy. But here’s the thing. There are parts of the content creation process that are mind-blowingly frustrating to learn, and why the hell would you bother when people have spent years studying their craft, and then many more years honing their skills in that area? Be realistic. Yes, you can do everything yourself. But do you really need to? Have you got the time to learn all those skills? Are you really going to get it done faster or more effectively? I tried my hand at all sorts of things like graphic design, ads, book-keeping, before I realised that I was simply wasting my time, getting frustrated, and still ending up with an inferior product. Work out what your hourly rate is. Work out what the hourly rate of the expert is. Decide whether you’re prepared to spend the time they have learnt, learning their skills, so you can do it yourself, or just hand the process over so you KNOW it’s going to be done efficiently, effectively, freeing up YOUR time to focus on things that are in your zone of genius. Realise you don’t have the budget for it all just yet? Weigh up whether waiting another year until you DO have the funds, is a better choice – it might just give you the time you need to actually organise and write out all your IP so when you have the budget, you can get it all produced in half the time. ACTION: Find out all the steps involved in content creation, then decide whether you’re going to DIY or outsource. Be realistic and put a time frame or monetary figure on what that’s going to cost you. Know how you’re going to deliver the product, BEFORE you create it. I cannot tell you how many of my clients completely change their mind on what type of content they’re going to create, when they realise what options they have for actually delivering it. It really boils down to what your clients actually want (more on that later) and often times, grand ideas of full video training with video embedded into powerful visual aids complete with transcripts, workbooks and audio versions, fully hosted on a bright sparkly custom designed website that costs over $10K to design, get fully functional , sells your product effortlessly, is easy to navigate AND user friendly, actually just becomes a podcast hosted on iTunes. Don’t waste precious time, money and energy creating something you don’t actually need to deliver. Consider all your options, make sure it’s something your client actually wants, then go about making it happen as simply as possible. Is the Rolls Royce delivery system really what you need at this very point in time? Or is it something you can build towards, once you know your product is a winner? ACTION: Decide what your clients actually need, and the most efficient and effective way to deliver that. Set a budget for what you can afford in terms of time and money, to make that happen. Make sure you’re supporting yourself and your needs, during the process. I spent the first 2.5 years in my business, working from home, completely isolated from the real world, getting everything I ‘needed’ online. Support, learning, ideas, my contractors, my clients, everything. Or so I thought. I ended up on the verge of a complete breakdown, physically and mentally, because I simply wasn’t getting the support I needed. When I reached out to other small business owners in my city, I found amazing people going through exactly the same things as I was going through, and business really started picking up. Friends and family are awesome, but if they’re not running a small business it’s hard for them to understand a lot of what you’re going through and the advice they might give you might actually not be very helpful. ‘Just go and get a job, stop putting yourself under this pressure’, for example, was well meaning but completely off the mark, and if I’d followed that advice I know I’d be miserable today, back in a 9-5, feeling like a complete failure. Small business ownership is one helluva personal development journey and you NEED people in your life who get that, and can support you through it. When you’re going through a rough patch, consider why you needed to start your business in the first place, what your goals, vision, mission and needs were. Make sure you’re doing things to foster those sentiments every day, because ultimately they will inform how good you feel about your business. I’ve always had a ‘giving back’ component to my business because it’s always been a core part of who I am, what I do with my free time. Without it, my business just wouldn’t feel right and on dark days, it really brings me back to centre. If something is really important to you, then you need it in your business so you can feel good about what you’re doing. ACTION: Decide on your needs, make them a priority, and build them into your business model. Why? because there are loonies out there who will test you, your contracts, your terms and conditions, with no regard for the fact that you’re an actual human with feelings, bills to pay and a life to live. I’ve been there. Having good terms and conditions saved me on the loonie client front, but didn’t so much help me when hiring the right people. Know what you’re looking for in a contractor. Be sure they have the experience and skill level that you know you need for your job. Whether it’s a client or a contractor, protect yourself by having clear payment terms based on outputs and if you’re not gelling, don’t keep trying to accommodate them. Be clear on what you want and need, be honest when communication goes awry, protect yourself and your bank account from paying for goods and services you simply don’t need, or being forced to give refunds where refunds are simply not due. ACTION: See a lawyer about your contracts and terms and conditions, and do your due diligence when you’re researching your contractors. Know how to communicate what you do in a language that Google, and your clients, ‘get’. Why? because when you don’t, no one, including the search engines, get you, or what you do, or how much it can change lives. It really is as simple as that. You, being the expert, will use words that make sense for YOU because you’ve been in this game so long you know the lingo, the terms, the things that make sense to you and other experts in your field. So much of my early marketing centred around CREATE A QUALITY LEARNING EXPERIENCE which actually is what I do, and what I help others do. It doesn’t speak to a lot of my clients though. Yes, they want to do that, but it’s nowhere near as power as: BE REFERRED TO AS THE EXPERT IN YOUR FIELD. That resonates with people because it’s what they want to achieve, not what they have to do to achieve it. Your prospective clients are generally looking for a result, not the action they need to take to get there. It’s like saying LOSE WEIGHT FAST vs EXERCISE DAILY FOR 1 HOUR. Which would you be looking for? Your clients, and google, act in the same way. Use the words they’re using. Massive difference, and a massive difference to the success of your campaigns and courses. ACTION: Learn the language of your clients, how they describe what it is they need from you, how you can help them, their biggest issues or concerns, the sorts of things they google or search for in forums. Decide whether you’re going for a sprint, or a marathon, and pilot accordingly. Some of my clients come to me, as established experts in their field, and say Maria, I need to get this product up online, NOW. I’ve done this workshop 86646 times with all different audiences, I know it works, we just need to create the online version. Brilliant. Let’s do it then. Let’s go straight in, create these materials, get them online in the Rolls Royce version, let’s establish you as the expert in your field who also has kick arse online products. Other clients come to me and say – you know what, I know this stuff works one to one, I’ve done a few group versions, but I’m not sure about how it’s going to work online. Do you think it will? Good question. Only problem, is that I have no idea. The only people who DO, are your ideal clients. Only THEY can give you the feedback you need to make it into a program that is going to work – because they’re exactly the same people you’re going to want to pitch it to once that Rolls Royce version is ready. So, PILOT it with them first. If you don’t, you risk your ideal clients getting a not so ideal version of your content – what happens to your reputation then? It also puts a lot less pressure on you to come up with a fully-fledged, Rolls Royce version before you know whether you’re going to have a good ROI for the time and development costs you know you’ll need to outlay. ACTION: Decide whether or not you need to pilot your content, and set your budget accordingly. Provide serious bang for their buck. Regardless of whether you’re in pilot or Rolls Royce mode, make sure the expectations are clear, different learning styles have been taken into account and what your clients NEED from the learning experience is catered for. That way, you can totally blow them and their expectations out of the water, further cementing yourself as an expert in your niche, who really cares for their clients and provides over and above the call of duty. If you don’t? You run the risk of people being disappointed with what they got, confused by materials they don’t really like using and THAT is what they’ll walk away telling people. Up to you. What would you prefer your cleints saying? ACTION: Set clear expectations, cater to different learning styles and client needs. Create a learning experience – don’t just curate information. There is SO MUCH INFORMATION on the internet these days – don’t just add to the white noise. Really helping people learn something that can change their lives, is not just about throwing information at people, it’s about scaffolding a complete learning experience. It’s about engaging them first up, by hitting on their pain points, so they can relate to how this new info will change their lives. Yes, there’s theory that’s involved and that has to part of the process – but most stop at this point – what really brings good information to life, is when you couple it with examples from the real world, case studies, demonstrations that show that new info IN ACTION. Giving them a chance to immediately go and apply that new information is also what helps them actually TAKE ACTION – which is, I’m assuming, what you really want people to do with it – right? We’ve all sat through presentations where we get talked at for an hour then walk away thinking – well that was interesting but what am I supposed to do with it now? Don’t be that presenter. Check out each of the points in this article, and you’ll find theory, an example, and a call to action – right? Keep in mind I have full lessons on each of these points that are complete with video tutorials, worksheets, the whole shebang – and that this article is just scratching the surface of what you need to know, but it’s still pretty powerful isn’t it? Take out the examples, and the action points and what are you left with? Theory. BOOOOORing. ACTION: Give them solid outcomes, solid action points, and show them how that’s possible by giving solid examples of how to do it correctly, and not so well, so they know the difference and will be confident to go away and implement immediately. Create learning materials that engage, inspire and motivate your clients to take serious action. No one wants to be that presenter or writer that makes their clients fall asleep. You want to be the sort of presenter that has people on the edge of their seats, answering your questions, having a laugh, having AHA moments. They’re the sort of learning spaces where people thrive and real change and growth happens, online and offline. When you provide that, your clients become your biggest fans and again, help you create a business that thrives on repeat customers and clients who are coming to you because you’ve been referred as the expert in your niche. ACTION: Learn the basics behind learning materials that WORK; it’s not just the visual aids you use, but also mastering the art of an effective structure, and the clever delivery of that content. Continuously improve your content so your reputation grows as someone who stays current, cares about their clients and responds to feedback – the good, the bad and the ugly. When it’s all said and done, all these points are helping you to quickly and effectively create learning experiences that will confirm your place as the expert in your niche. The pinnacle of all good teaching is to learn, improve and grow, every time you deliver that content. That happens when you ask for, receive and act on constructive feedback from your clients, to improve the quality of your content; they’re the ones that need your help, and they’re best placed to help you deliver it in a way that is most effective. Every time I work with my clients I find lessons that can be improved, worksheets that can be formulated, instructions that can be clearer. Asking your clients directly how you can improve adds a layer of improvement you, as the creator, cannot see because of how close you are to your content. When you inject a culture of continuous improvement into your learning materials, business, and life in general, magic really does start to happen. ACTION: Ask for, receive and act on constructive feedback from your clients, to continuously improve the quality of your content. Be prepared. Know what is coming up so that you can plan accordingly. Don’t spend weeks, months or years procrastinating because you don’t know where to start, OR just blindly start creating without any concept of what you’re hoping to achieve, including your time and financial budgets. You don’t have to make the same mistakes I’ve made, or those I’ve seen my clients making. Do the preparation, know what you’re getting yourself in for, then take a confident step forwarding KNOWING you’re on the right path. Published 19th January 2017 in Flying Solo as: Before you create an online course, read this. Know you’re not quite as prepared as you should be? I hear you. 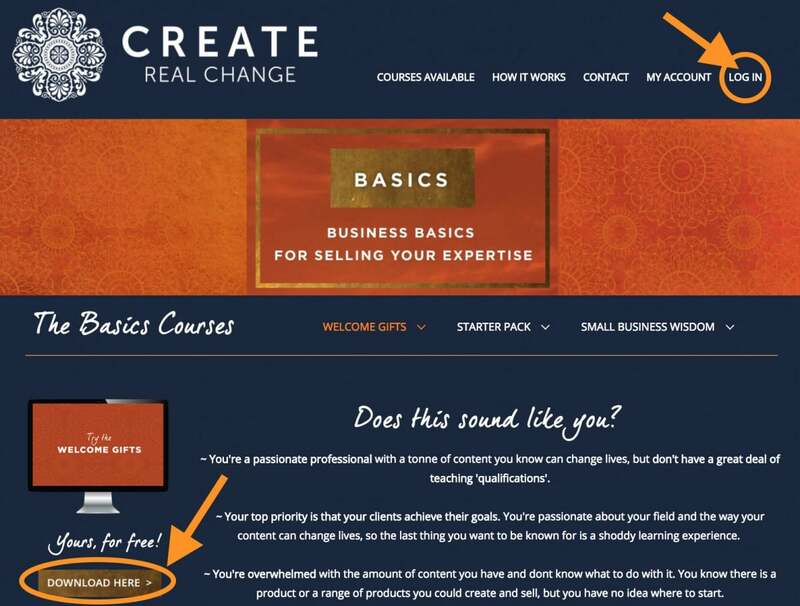 You also might now have a clearer idea of why so many professionals give up all together when it comes to getting their content out of their heads, and into something that will create real change in the lives of their clients. Don’t become a statistic. Remember why you do what you do. The process doesn’t have to be confusing or overwhelming. That’s why I do what I do: help others avoid the pitfalls and create highly effective content efficiently. If you’d like the full checklist of points, and the corresponding actions you need to take before YOU get started creating content out of your expertise, there are two actions you can take. Do the Content Creation Quiz. It’ll give you a score out of 62, that shows you how prepared you are for the Content Creation journey. You’ll also get an email for every question you answer No or Not sure to – giving you links to free articles that will help you on your way to being prepared for that stage of the content creation journey. 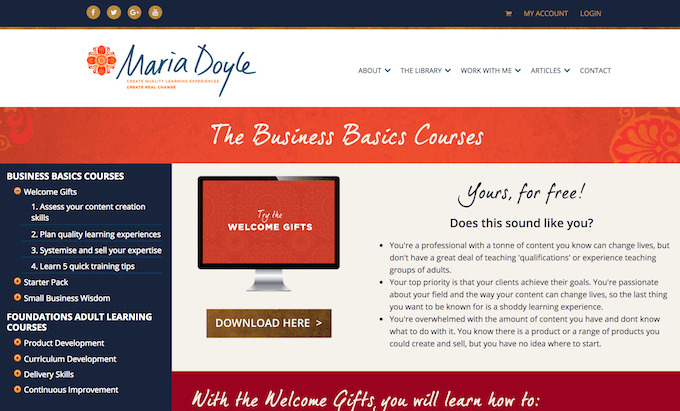 Or, Download the Content Creation Checklist – which is the first lesson in the Welcome Gifts. It’ll give you direct links to the lessons in the Library that will help you with the areas you need help with. You can access this FREE resource in The Library. Already a member? Click here to login, then click here to access your lesson. If you haven’t already signed up for your FREE account at The Library, go to this link, click on the ‘DOWNLOAD HERE’ button, and pop in your name and info to set up your account for The Library. Once you have set up your login, follow the instructions above to get access to your FREE lesson.